Agent Sitwell. Agent Hand. Agent Shaw. After the events in Winter Soldier, all three of these agents, introduced to the show in this episode, were affected. Sitwell was affected by a car on a freeway. Hand was affected in the head by Ward. And Shaw was an agent caught in the middle of things. Maybe he'll be back. Watching this episode was fun the first time, and fun this time. The comedy and the snappy dialogue and the reactions of the characters to each other is refreshing. Clark Gregg's smile as Fitz has his comedy bit with the door is priceless. And then I remember that most of these people will either be Hydra or dead or both at the end of the season. The team up with Fitz and Ward is fun to watch. Still. It's fun. The big brother/little brother dynamic and back and forth shows real chemistry. 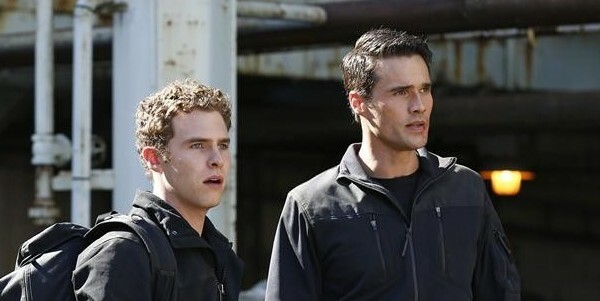 And then I remember that Ward plans to betray them because he's Hydra. Skye and Simmons in the Hub is, well, not so exciting nor as natural. But Simmons shooting Sitwell still cracked a smile on my face. Because I remember what he does in Winter Soldier. This is not a throwaway episode. It's a character building, relationship revealing espionage thriller that has flaws. But over all, this is one of the good ones.